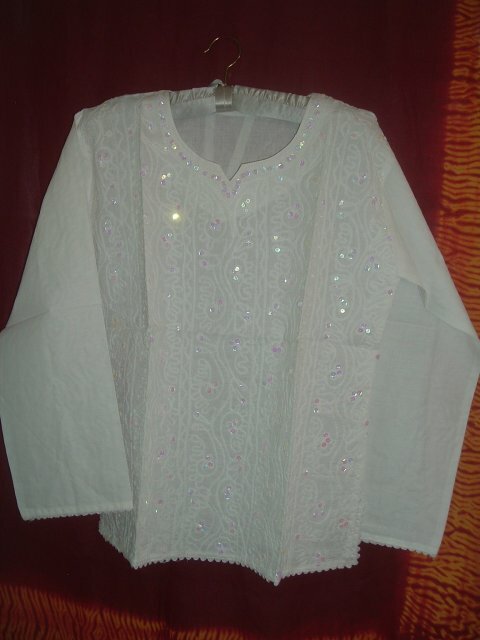 Comfortable white cotton kurta / tunic with beautiful embroidery using white thread in the front. The tunic also has lace work at the sleeves cuffs & base. Sequin work all over the front and neckline. Very comfortable summer wear; can be worn with jeans or any other pants. This kurta is not sheer. Please note that since these kurtas are handmade, some stains and marks may be present. This item in Indian Kurtis & Tunics category was first added to our catalog on 03-21-2013. Buy Embroidered White Cotton Kurta For Teen Girls & Women, sold & shipped by desiVastra.com where you can shop online for Traditional Dress for Baby Boy & Girl, Indian ethnic Wear for Kids. This Kurtis & Tunics collection has been tagged as Mirror Work Kurta, Cotton Kurti, Indian Clothing, Indian Tunic.